All orders are shipped within 48 hours (excluding weekends and holidays). Orders are shipped via UPS ground. Once your order is shipped you will be sent a UPS tracking code to track your order. All items must be returned within 15 days of receipt and in the original packing. Thank you for visiting my store. There is a number of unique items to enhance your home and garden. All at reasonable prices. 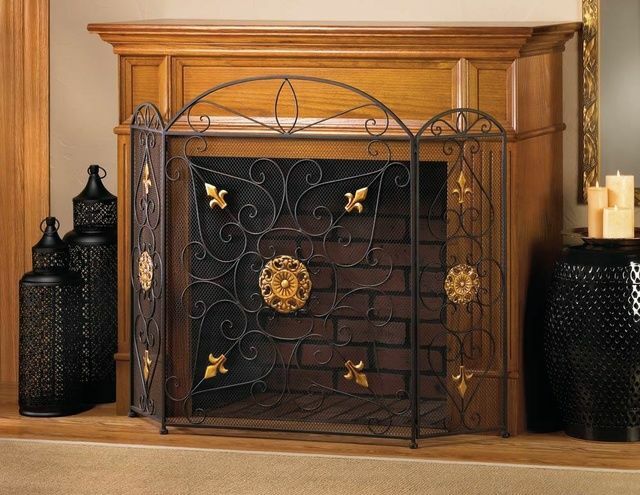 Transform your fireplace into a showcase of elegant style with this luxurious fireplace screen. Made from black iron mesh and embellished with golden ornaments, the three-panel construction can be adjusted to fit your space perfectly. Center panel: 26" x 34 1/2" high; each side panel is 10 5/8" x 31 5/8" high. Dimensions: 26" x 10.6" x 31.6"